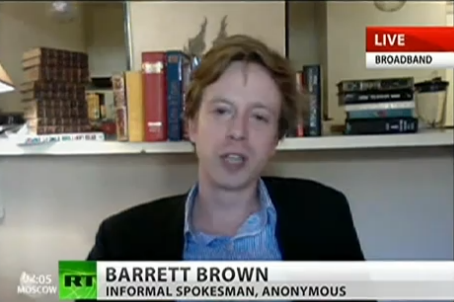 When U.S. journalist Barrett Brown was slapped with a potential 105-year jail sentence stemming from his reporting relating to the hacker group Anonymous, it raised eyebrows about how exactly could he be facing such a stiff penalty for his involvement. Brown had a career that spanned across both the fields of investigative journalism and online activism. He co-wrote a book in 2007 and has penned articles for Vanity Fair, The Guardian, and the Huffington Post. He then became known as an unofficial spokesman for Anonymous following his articles in support of the group. Through Project PM, Brown began in 2011 to analyze the files of private global intelligence firms such as HBGary, which had been hacked by Anonymous and had thousands of its internal emails made public. Brown and others with Project PM began to analyze five million disclosed emails from Stratfor, another private firm hacked by Anonymous. Although not involved in the direct hacking of these companies, Brown posted links to the files on the Project PM site for others to access. Federal investigation into Brown began shortly after he publicized the Stratfor files, which had also contained credit card information from the company’s clients. On March 6, 2012, agents with the Federal Bureau of Investigation (FBI) raided Brown’s house and took away his laptop and other belongings. Brown later uploaded a series of videos to YouTube describing his arrest and treatment while in detention. In one expletive-filled video where he refers to one of the participating FBI agents, Brown states that he will “ruin his life.” Brown also talks about fearing for his life from the Zetas, the Mexican drug cartel gang. The aftermath from the videos spurred the FBI to again raid both Brown’s and his mother’s house in Dallas, Texas in Sept. 2012. At the time of Brown’s arrest, he had been chatting in an online forum. The commotion and yelling between Brown and the federal agents can be heard in the audio recording of the chat room session. Brown was indicted on Oct. 3, 2012 on three charges relating to his video threats against the FBI agent. On Dec. 14, 2012, he received 12 additional federal charges related to the Stratfor hack and the company’s credit card information. Two counts of obstruction of justice were filed against him on Jan. 23, 2013 stemming from the Sept. 2012 raid. Media observers and other journalists have criticized the charges against Brown as excessive. Some see issue with the charges against Brown and his posting of the Stratfor documents as criminalizing the process of linking and pasting to other websites. “The documents to which he linked contained all sorts of other information that he wanted to investigate and write about, including Straftor's client list. There are countless legitimate reasons to link to those documents, particularly for a journalist. That this extremely dubious allegation now forms the crux of the [government’s] case against him reveals what a persecution this actually is,” wrote The Guardian’s Glenn Greenwald in his article about the Brown case. The maximum number of years in potential jail time from these counts – 17 in total – equal to 105 years. In comparison, Anonymous member Jeremy Hammond would serve only up to 10 years in prison for his role as the actual hacker in the Stratfor leak. Reporters Without Borders pointed out that Brown was not the actual hacker in any of his reporting. “Above all, Barrett was an investigative journalist who was merely doing his professional duty by looking into the Stratfor emails, an affair of public interest,” said Reporters Without Borders Secretary Christophe Deloire. Brown’s trial is expected to start in September 2013.